This memorial website was created in memory of our loved one, Eddy Louiss, 74, born on May 2, 1941 and passed away on June 30, 2015. Where Eddy Louiss is buried? Locate the grave of Eddy Louiss. How to find family and friends of Eddy Louiss? What can I do for Eddy Louiss? was a French jazz musician. His primary instrument was the Hammond organ. As a vocalist, he was a member of Les Double Six of Paris from 1961 through 1963. He worked with Kenny Clarke, René Thomas, and Jean-Luc Ponty. He was a member of the Stan Getz quartet (with René Thomas and Bernard Lubat) that recorded the Getz album Dynasty (1971). In duet, he recorded with pianist Michel Petrucciani (1994) and accordionist Richard Galliano (2002). His later recordings—for example, Sentimental Feeling and Récit proche—combine jazz with rock and world music. Note: Do you have a family photo of Eddy Louiss? Consider uploading your photo of Eddy Louiss so that your pictures are included in Eddy Louiss's genealogy, family trees & family history records. Sysoon enables anyone to create a free online tribute for a much loved relative or friend who has passed away. Address and location of Eddy Louiss which have been published. Click on the address to view a map. Eddy Louiss was born in France. 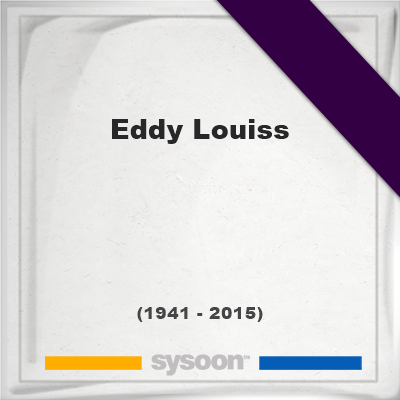 Eddy Louiss died in France.